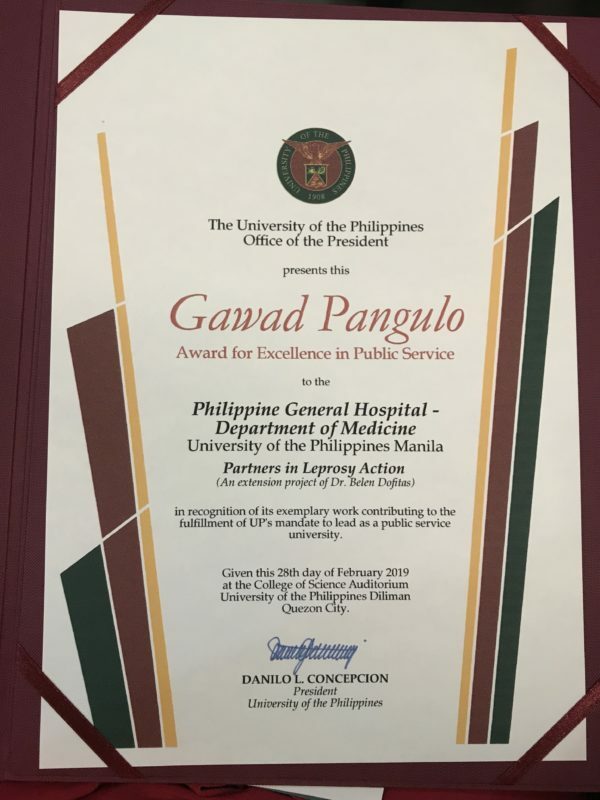 The University of the Philippines 3rd Gawad Pangulo Award for Excellence in Public Service has been given to UP initiatives and projects that exemplify “dangal” (honor) and “husay” (excellence)! This year, Partners In Leprosy Action (PILA) is one of the five projects/initiatives deemed worthy by the esteemed UP Padayon Selection Committee. Awarding Ceremonies were held in UP Diliman on February 28, 2019. Present during the awarding were Dr. Belen Lardizabal Dofitas (Project Leader), Raquel de Villa-Reyes (Philippine Leprosy Mission), Dr Manuel Jorge (past Chairman, Dept of Medicine-PGH), Dr. Eileen Cubillan (Chief, Section of Dermatology, Dept. of Medicine-Philippine General Hospital), Dr Carmencita Padilla (Chancellor, UP Manila), and UP President Danilo Concepcion. Thank you to UP Padayon Office for this honor! Source: Jo. Florendo B. Lontoc, “Programs on livelihood, health, children, and culture get public service award” The University of the Philippines. Retrieved: 18 March 2019. This entry was posted in News and Activities. Bookmark the permalink. Leprosy is a chronic, infectious disease of the nerves and skin. It is curable yet the stigma and discrimination may last a lifetime, leading to poverty. This project will help support the school needs, health care, and counselling of 30 Filipino children and young adults who have leprosy or whose parents have been disabled by leprosy. Formal education and skills training will enable them to gain income, escape poverty, overcome stigma and discrimination, be productive and live with dignity.